Houlton High School emerged as a viable entity in Maine's high school football ranks after starting out playing the eight-man game. 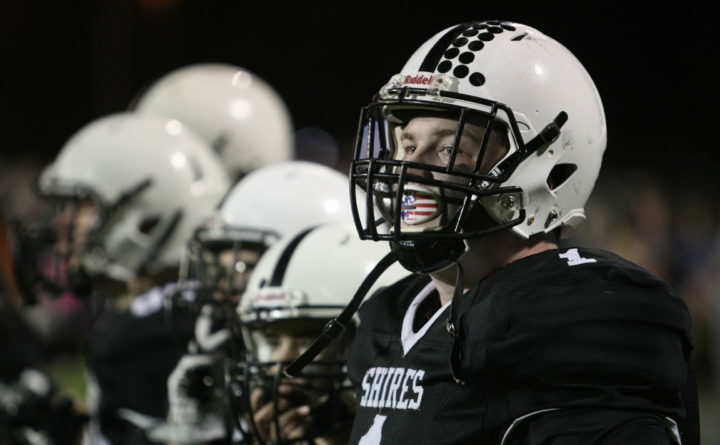 Continued concerns about roster numbers and player experience and safety at Maine high schools may lead the Maine Principals' Association and state coaches to consider eight-player football to help keep the game viable in Maine. The thought of introducing an eight-player alternative to Maine high school football is nothing new. The Maine Principals’ Association surveyed its membership in 2011 about providing the option for smaller schools amid a general uptick in programs adding the sport — only to see respondents resoundingly oppose any deviation from the 11-player norm. “Seven years ago football was growing by leaps and bounds in our state, and what’s happening now is that schools are having a difficult time maintaining their programs because of low numbers,” said Susan Robbins, athletic administrator at Yarmouth High School and a member of the MPA Football Committee. The MPA already has taken several steps since 2011 to promote a more competitive football environment. A fourth class was added in 2013 to reduce the enrollment differential between the largest and smallest schools in each division, and the establishment of cooperative teams involving two or more schools to help expand roster size has been encouraged in recent years. A developmental Class E was created last fall for teams that already had dropped from varsity status or were in danger of doing so. And crossover scheduling between schools of a similar competitive status from different classes and regions also was expanded last year with some promising initial results. But none of the changes ultimately address the biggest issue facing the sport— its decreasing number of participants. According to an annual report by the National Federation of State High School Associations, high school football participation in Maine declined from a high of 4,153 players in 2008 to 3,657 in 2016 — a drop of 11 percent. The decrease is attributed to multiple reasons, including a statewide drop in student enrollment, more interscholastic activities being offered, sport specialization by some student-athletes, and continuing concerns about the prevalence of head injuries in football. “I think we’re seeing a number of programs with declining numbers and struggling to maintain their programs with the number of athletes that are participating,” said Mike Burnham, the MPA’s assistant executive director and liaison to the organization’s football committee. That has left numerous programs with small rosters. Six teams with fewer than 30 players each — Boothbay, Camden Hills of Rockport, Maranacook of Readfield, Sacopee Valley of South Hiram, Telstar of Bethel and Traip Academy of Kittery — opted to play at the non-championship Class E level last fall. Traip subsequently suspended its 2017 schedule when school officials determined the Rangers roster had dropped to an unsafe level in both numbers (low to mid teens) and experience. While the original group of Class E teams will return to the gridiron this fall, joined by newcomers Dirigo of Dixfield, Freeport and Old Orchard Beach, some believe the sport needs even more support. The football committee is expected to begin discussing eight-player football at its next meeting this summer. “I have a very, very high level of concern for the game of football and its future,” said former University of Maine player and coach and current Colby College football coach Jack Cosgrove. “What’s most bothersome to me is when those teams have to close shop in the middle of the year and forfeit the rest of their games because of injuries and the numbers factor. I think there’s a way of preventing it from happening and perhaps eight-man football, for a certain school population, is part of it,” he added. Eight-player football is similar to the traditional 11-player version, minus three players on each side of the line of scrimmage. Offenses typically have two fewer linemen and one fewer running back or receiver. Defenses often have two fewer defensive backs and one fewer lineman. Seventeen states sponsored eight-player high school football in 2016, with 19,514 players competing for 841 schools. Teams typically play on fields 100 yards long, though in some cases the fields are narrowed from the traditional 53 1/3-yard width to 40 yards. Wyckoff was instrumental in the development of the Aroostook Football League, which fielded non-MPA high school-age football programs in Presque Isle, Madawaska and Houlton that played 8 vs. 8 from 2006 to 2014, when Houlton joined the MPA ranks. With the Aroostook (Presque Isle) Huskies and Valley (Madawaska) Mustangs left as the only remaining eight-player teams in Maine, they switched to 11-player football to find more games. The AFL has morphed into the Maine Independent Football League with additional teams from Damariscotta, China and Berlin, New Hampshire. The AFL still offers eight-player, middle-school football for teams from Houlton, Madawaska, Millinocket and Presque Isle. One state that has expanded its field of high school football teams by embracing eight-man football is Michigan, where 10 percent of its 620 football-playing schools now compete in the eight-player version. “The net effect is we’ve ended up saving Friday Night Lights in some communities, turning them back on in some places where they haven’t been seen in quite a while, and putting them up at some of our charter and private faith-based schools,” said John R. Johnson, director of broadcast properties for the Michigan High School Athletic Association. Michigan sponsored its first eight-player football postseason tournament in 2011 after it reached 20 small-school teams in the division, mostly from more rural areas of the state. The number of eight-player teams in Michigan has more than tripled since and in 2017 the state crowned champions in two enrollment-based divisions of eight-player competition for the first time. Whether eight-player football comes to Maine may depend on whether traditionalists embrace the option and enough schools opt to make the change. “I think it’s a good alternative for those programs that year in and year out are looking at dangerously low numbers,” said Burnham. Cosgrove, whose relationship with Maine football dates to his quarterback days at UMaine in the mid-1970s, supports a more direct route to eight-player football. Those challenges, Cosgrove added, are not confined to game days. He said some coaches start with 23 players but routinely practice with only 16. “There’s no skill-set development, there’s none of the things that are naturally part of every other sport because of the challenge of the numbers,” he said.